Stay ahead of tomorrow’s demand for high-density mobility with the new Extreme Networks AP 8533. 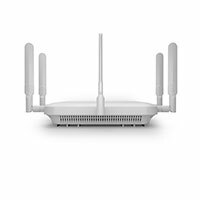 Eight times the capacity of previous Wi-Fi technology, this true WAVE 2 802.11ac solution simultaneously supports MU-MIMO client devices and comes with Extreme Networks Triple Sensor technology to engage customers, prevent new and existing security threat vectors and optimize network performance. The AP 8533 makes networks lightning fast, and applications steadfast even at peak times. That’s because this 802.11ac powerhouse offers true Wave 2 performance, simultaneously supporting Multiple-User MIMO client devices critical to high-density mobility. Mitigating security risks requires the full-time 802.11ac and Bluetooth sensors integrated into the AP 8533. They are dedicated solely to quickly detecting threats. Using the deep signature database of AirDefense, they can proactively disconnect any rogue devices to prevent intrusions. Thanks to the AP 8533’s BLE sensor, enterprises can communicate directly to shoppers and guests through their smartphones. Use Apple iBeacon™ and Google Eddystone™ to send contextual offers, advertise information and encourage usage of captive portals.